June 11, 2015 – Planets with helium skies may constitute an exotic planetary class in our Milky Way galaxy. 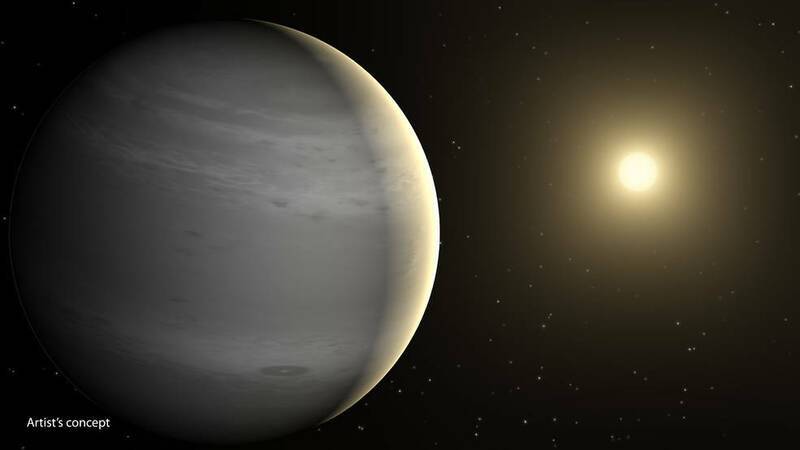 Researchers using data from NASA’s Spitzer Space Telescope propose that warm Neptune-size planets with clouds of helium may be strewn about the galaxy by the thousands. Prior to the study, astronomers had been investigating a surprising number of so-called warm Neptunes in our galaxy. NASA’s Kepler space telescope has found hundreds of candidate planets that fall into this category. They are the size of Neptune or smaller, with tight orbits that are closer to their stars than our own sizzling Mercury is to our sun. These planets reach temperatures of more than 1,340 degrees Fahrenheit (1,000 Kelvin), and orbit their stars in as little as one or two days. In the new study, Hu and his team make the case that some warm Neptunes — and warm sub-Neptunes, which are smaller than Neptune — could have atmospheres enriched with helium. They say that the close proximity of these planets to their searing stars would cause the hydrogen in their atmospheres to boil off. “Hydrogen is four times lighter than helium, so it would slowly disappear from the planets’ atmospheres, causing them to become more concentrated with helium over time,” said Hu. “The process would be gradual, taking up to 10 billion years to complete.” For reference, our planet Earth is about 4.5 billion years old. Warm Neptunes are thought to have either rocky or liquid cores, surrounded by gas. If helium is indeed the dominant component in their atmospheres, the planets would appear white or gray. By contrast, the Neptune of our own solar system is a brilliant azure blue. The methane in its atmosphere absorbs the color red, giving Neptune its blue hue. A lack of methane in one particular warm Neptune, called GJ 436b, is in fact what led Hu and his team to develop their helium planet theory. Spitzer had previously observed GJ 436b, located 33 light-years away, and found evidence for carbon but not methane. This was puzzling to scientists, because methane molecules are made of one carbon and four hydrogen atoms, and planets like this are expected to have a lot of hydrogen. Why wasn’t the hydrogen linking up with carbon to produce methane? 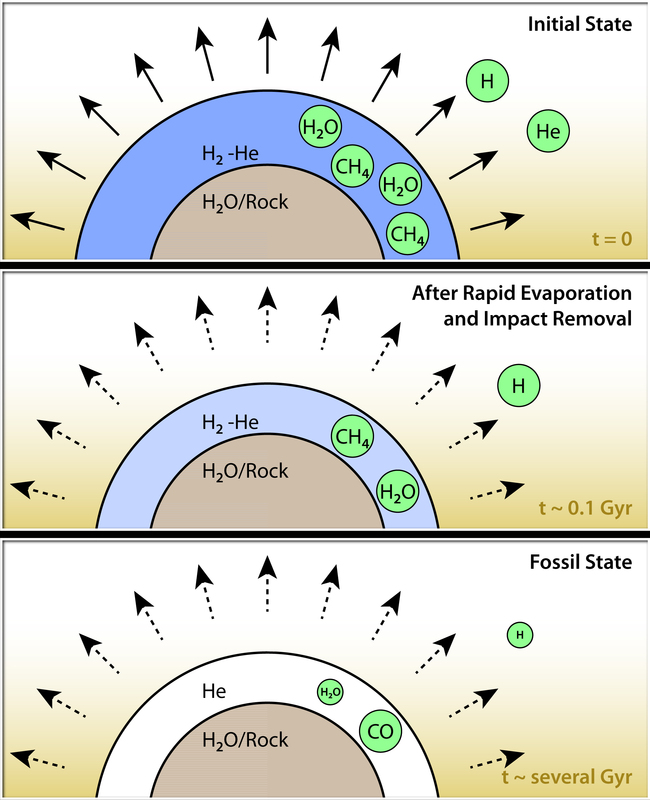 According to the new study, the hydrogen might have been slow-cooked off the planet by radiation from the host stars. With less hydrogen around, the carbon would pair up with oxygen to make carbon monoxide. In fact, Spitzer found evidence for a predominance of carbon monoxide in the atmosphere of GJ 436b. The next step to test this theory is to look at other warm Neptunes for signs of carbon monoxide and carbon dioxide, which are indicators of helium atmospheres. The team says this might be possible with the help of NASA’s Hubble Space Telescope, and NASA’s upcoming James Webb Space Telescope may one day directly detect that helium. Meanwhile, the wacky world of exoplanets continues to surprise astronomers. A third author of the paper is Yuk Yung of the California Institute of Technology in Pasadena and JPL. Ball Aerospace of Boulder, Colorado provided the Cryogenic Telescope Assembly (CTA) and two of the three science instruments for Spitzer: the Infrared Spectrograph (IRS) designed to provide the telescope with low and moderate spectral-resolution spectroscopic capabilities; and the Multiband Imaging Photometer (MIPS), a far-infrared instrument designed to provide imaging photometry and scan mapping. The CTA is the “eyes” of Sptizer. Its lightweight beryllium telescope and innovative passive thermal control system can detect the faint infrared light produced by cosmic objects. The unique cooling system aboard the CTA allowed a “warm” launch, which was a historical first in space flight. NASA’s Spitzer Space Telescope was built, integrated and tested at Lockheed Martin Space Systems in Sunnyvale, California. Spacecraft operations are based at Lockheed Martin Space Systems Company, Littleton, Colorado. JPL manages the Spitzer Space Telescope mission for NASA’s Science Mission Directorate, Washington. Science operations are conducted at the Spitzer Science Center at the California Institute of Technology in Pasadena. Data are archived at the Infrared Science Archive housed at the Infrared Processing and Analysis Center at Caltech. Caltech manages JPL for NASA.